The first week of April has been insanely great for Mac users. Apple apologized that its Late 2013 Mac Pro trashcan failed to meet users' needs. It vowed to completely redesign its next Mac Pro to make up with its core user base, the creative professionals. Two days later, Nvidia announced a beast of a graphics card, the GTX Titan Xp. It subtly dropped the news Pascal drivers for macOS would arrive within a week to support this new GPU and a whole host of GTX 10 series graphics cards. We prepped our Mantiz Venus Thunderbolt 3 external GPU enclosure with a GTX 1080 Ti then hooked it up to a Late 2016 15" MacBook Pro. Everything was ready to go pending the web drivers from Nvidia. April 11, 2017 marked an 11-month wait for Pascal driver support in macOS since the GTX 1080 release on May 27, 2016. This was a much longer delay than the previous seven-month wait for Maxwell drivers. All was forgiven though. Nvidia web drivers 378.05.05.05f01 are here, and they work with some visual glitches with Goalque's automate-eGPU script to enable GTX 10 series eGPU support in macOS. This is the beta version of the drivers and hopefully these glitches will be remedied by the time the Pascal drivers are finalized. Maximising TB3 eGPU performance: TB3-CPU vs TB3-PCH, how many PCIe lanes are attached? The past five months have taught us there are frustrations in selecting the right components for your eGPU build to get the most performance. Some notable issues we’ve discovered include the 2x PCIe lane cripple with the majority of the Dell XPS line, the TI83 enclosures’ firmware Host-to-Device half-speed limit and Intel’s Thunderbolt 3 fine print (pg6) which states Thunderbolt “DATA” (i.e., PCIe traffic) is throttled down to 22Gbps. Our reports have prompted Dell to clarify its XPS laptops PCIe lanes and have encouraged external GPU manufacturers to push Intel for firmware updates. To get the most out of an eGPU setup, you should start with a computer that is a good Thunderbolt 3 host. From the limited resources we’ve gathered to date, the Late 2016 15″ MacBook Pro is currently the best host for external GPU implementation. We found Apple attached the PCIe lanes directly to the quad-core i7 CPU in the newest 15″ MacBook Pro laptops. This is unlike the majority of Thunderbolt 3 laptops which route the PCIe lanes through the PCH. The disadvantage of having the Thunderbolt connection through the PCH is that the PCH shares bandwidth with other internal components (e.g., PCIe flash storage, network cards, USB ports) and potentially limits the eGPU performance. Nando prepared this table explaining max bandwidth for eGPU usage on the Late 2016 MacBook Pro. It's an exciting time for our eGPU community. Apple is beginning to take steps in the right direction to address the power and performance needs of its pro users. At the same time Nvidia is expanding the selection of graphics cards available for eGPU implementation on Macs. I can not successfully install automate-eGPU.sh in 13" MacBook Pro 2016 with AKiTio Node plus GTX1070. Did I do something wrong? Could you please write the steps for us? Thx a lot. What was the error you saw when you ran the automate-eGPU script? What does it look like in Graphics/Display? The Firmware Version 21.1 for your Node may be causing a problem here. After the latest April firmware update, the Node reports 25.1. When and where did you acquire this AKiTiO Node? I have 15" MBPtb with RP460 | Razer Core | GTX 1080. I did TB3 enabler and automate-eGPU script. It detected the GTX1080 and installed 378 webdriver. I reboot after running the script and it's not detecting the GPU. What am I doing wrong? I don't have experience with the Razer Core. The newest Nvidia web drivers are still glitchy. I'd recommend rebooting your MacBook Pro with the eGPU attached and see if it will eventually work. Could you possibly post benchmarks while running on an external display via eGPU with the internal monitor disabled? Updated with benchmarks through external display. I need to get a 4K display to test this setup at higher resolutions. Many many thanks for that! The improvements over the internal display-only setup are quite remarkable. I would presume that you accelerated the internal display with a headless HDMI adapter? I will install Windows in Boot Camp and run these tests soon. I have tried the same setup that you have here (except using an Akitio Node) and I can't get numbers anywhere close to yours. On Heaven 1600x900 8XAA windowed Extreme with my 1080Ti, I got only 36 frames per second and a score of 906! I tried uploading a screenshot of the results, but received that HTTP 500 error again. There is something wrong with the site, I think. I'm using the same setup except a Razer Core instead of Akitio Node, but I can't get macOS detects the eGPU, neither internal nor external displays. Could you specify the steps you take to make it work? That is pretty much the same result my T430s gets at the same settings with a 1050Ti as an eGPU over Thunderbolt1. 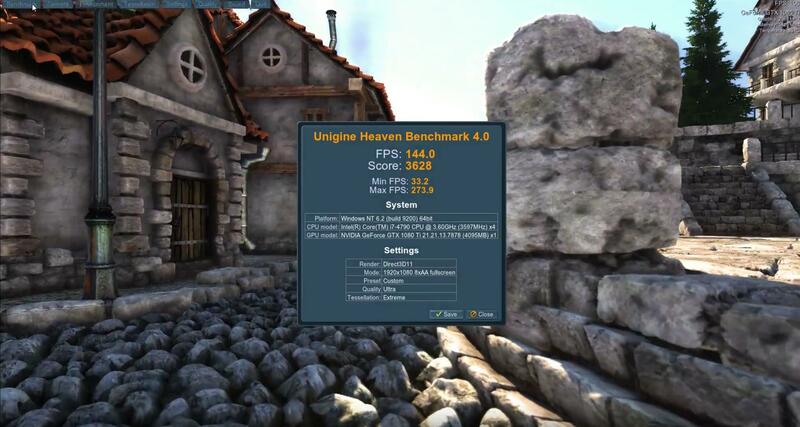 I suspect your benchmark is running off the dGPU, not the eGPU. Same with a 1080ti 🙁 Did you ever get it to work? What exactly do I need to do to get this running when my Mantiz arrives? I understand that I don't need to run the TB3 script, but I will have to run a different script? Thanks. - The Fan is pretty noisy, as it has an additional liquid cooling fan, I just put it in the case where it just had space, but I guess thats not really optimal. Any idea how I can optimise the setup to reduce the fan speed/noise? I can't help with the other points but I have read that connecting peripherals to the USB ports on eGPUs often results in problems... (laggy, disconnection etc). I mostly read that reg the Razer Core so not sure about Mantiz but might be the same? I wouldn't think that the Venus supports GPUs with liquid cooling. Maybe drill holes on the back cover where the SSD sits, and mount the radiator there if the tubes allow it. My internal display in MacOS is flickering on and off after successfully running the automate gpu script. My 2016 Macbook 15" 455, recognizes the my GTX 1080Ti and external monitor is working. I noticed the internal display starts flickering on an off after about 3-5 min in. Another thing to note is that when I run the Heaven benchmark its runs on my external display, but with my AMD 455 iGPU instead. Im running MacOS Sierra 10.12.4 I also disabled csrutil. I noticed the screen flashes when I tried the GTX 1080 Ti back in April. I think it's something related to the beta drivers. Besides these 2, everything works fine. For Razer Case, it was previous unstable FW issue, there was a fix for that and the issue was gone. for the fan noise, please change it to first fan connector. now it is in the 2nd, count it from the left. new FW is on the way, we will publish it soon. Hey guys, my mantiz is arriving next week. I'll pair it with a 2017 MBP. What's the difference exactly between automate-eGPU script and tb3 enabler script? Do I have to run both? @Rycco tb3-enabler script is a workaround for Thunderbolt 3 enclosures with the older TI82 controller to communicate with macOS. The Mantiz Venus has the TI83 controller and is fully compatible with macOS. You do not need to use tb3-enabler script. Once your Mac establishes communication with a Thunderbolt enclosure, automate-eGPU script facilitates eGPU recognition and driver installation so that external graphics can work in macOS. macOS High Sierra 10.13 has external graphics support and therefore automate-eGPU script should not be used. Goalque wrote and tested it for 10.9 to 10.12 only. Am I correct, that if you use the Radeon Vega RX 64 you don't need to run scripts with a Mantiz? Only if you go the GTX route?